From back cover: A rebellion is rising… The peasants of Sierr have dealt with Queen Livia’s cruel hand long enough. Sixteen-year-old Jacha Simyrna, who has spent her whole life stealing food and places to sleep in the queen’s castle, finds herself trapped between the two sides. The clink of promised gold echoes in Jacha’s ears as she sets out to do what the queen asks of her, but she finds life with the peasants different than she had ever thought it would be. Will Jacha yield herself to the powers of money, or the powers of friendship? I started reading this book on the heels of a self-published book that made me cringe. Once you have a bad experience, you wonder if you have read all the good self-published books. This book proved that self-published books are, many times, wonderful. It restored my faith in the self-publishing community. Thank you Ellyn! This book started out as a nice story and an enjoyable one, but about a third of the way through it took a twist and became a totally awesome book! I felt it was a unique story with unexpected twists that will keep you on the edge of your seat. Ellyn has a wonderful way with description and characters. The only weak part of her book that I found was that were a couple of references to things that seemed out of place in a medieval/fantasy world. However, I only think that there were two or three places where that happened. Jacha was a very real, relatable character. Her internal struggle between the two sides is believable and takes unexpected turns. It was by far my favorite part of the book, and what made me want to keep turning those pages. For those who try to avoid romance, you are in luck with this book. There is only a hint of romance for the main character. More of a maybe-when-we’re-older-but-for-now-we’re-just-friends type of romance which begs for a sequel. As for age range I think that even though there is some violence (what would a book about a rebellion be without a battle) that any child can read it. I highly recommend Torn Heart for people looking for a non-magical adventure book. 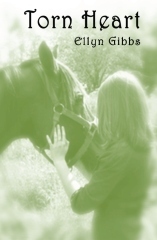 I received this book from Ellyn Gibbs in exchange for my honest review. I was under no obligation to write a positive review. The opinions in this review are entirely my own.